John Krasinski is an American actor and filmmaker who gained fame and recognition for his role as Jim Halpert on the NBC sitcom The Office. In addition to that, this debonair good looking charm has starred in films such as Away We Go, It’s Complicated, Something Borrowed, Big Miracle, Promised Land, Aloha, 13 Hours: The Secret Soldiers of Benghazi, The Hollars, and A Quiet Place. John Krasinski was born on 20 October 1979, in Brighton, Boston, Massachusetts, U.S.
He’s currently 39 years old. His ancestry is Polish and Irish. Krasinski graduated from Newton South High School in 1997.He later enrolled at the Brown University where he studied theatre arts under Lowry Marsh and John Emigh, and graduating in 2001 as a playwright with the honors thesis “Contents Under Pressure”. He also went to National Theater Institute in Waterford, Connecticut, to hone his acting skills. He also attended the Royal Shakespeare Company, Stratford-upon-Avon, England and The Actors Center, New York City. John Krasinski married English actress Emily Blunt on 10 July 2010 in Como, Italy. The grand wedding was attended by Hollywood megastars like George Clooney, David Schwimmer, Meryl Streep and Matt Damon. Together they have two daughters, Hazel (born 2014) and Violet (born 2016). Before marrying Emila, John has dated actress Rashida Jones from 2005 to 2006. He wears a size 12 (US) shoe. John Krasinski was doing small roles before making it big in the industry. His first role was an uncredited one in the 2000 film State and main, in which she payed as Judge’s assistant. Krasinski’s breakthrough role was as Ryan/Subject #20 in the 2009 film Brief Interviews with Hideous Men, which was directed as well as produced by him. In 2003, John made his first television appearance in an episode titled “Good Advice” of the Tv series, Ed. In 2005, he landed a breakthrough role as Jim Halpert in the NBC sitcom The Office from 2005 to 2013. The TV series was super hit that earned him critical acclaim as well as a number of awards. He also served as a producer and occasional director of the show. 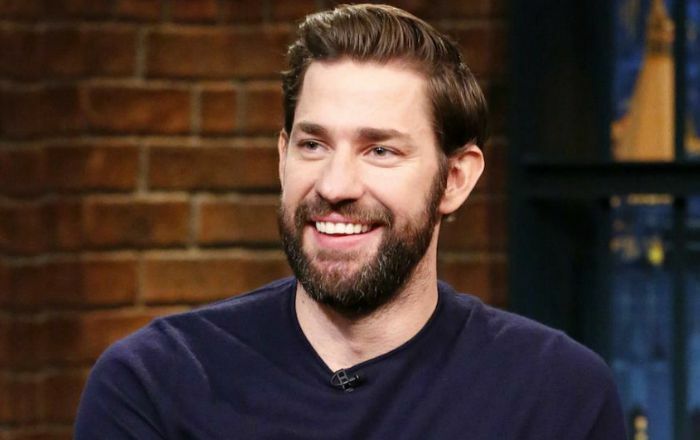 Krasinski has appeared in over a dozen of TV commercials for Marshalls, Kodak, Ask.com (Voice), Apple TV (Voice), Coke, Blackberry Storm (Voice), Carnival Cruise Lines, New Era caps, Pepsi and Esurance. He did voice-over for many advertisements before earning a name for himself in Hollwyood. His total net worth is estimated at $16 million. He charges $125K per episode for his work in TV shows. At school, Krasinski made his stage debut as Daddy Warbucks in a sixth-grade school production of the musical Annie. He and The Office co-star B. J. Novak were high school friends. He used to be a member of the sketch comedy group Out of Bounds during his college years. Standing at 6’3″ tall, he is the shortest guy among his brothers. One of his brothers is 6’10” tall and the other is 6’6″ tall. He taught English as a foreign language in Costa Rica before enrolling at Brown University. There he studied English Literature thinking to become a English teacher. Over time, he developed interest in acting and film-making. In 2000, Krasinski worked as a intern as scriptwriter on the show Late Night with Conan O’Brien. John has almost decided to give up on acting before being cast on The Office in 2005 as he was disappointed working in small jobs for over two and half years. John won the Screen Actors Guild Awards for ‘Outstanding Performance by an Ensemble in a Comedy Series’ for ‘The Office’ in 2006 and 2007, consecutively. In 2006, Krasinski was ranked #9 in People Magazine’s Sexiest Man Alive list. In April 2011, he co-starred in a New Era/Major League Baseball ad campaign with Alec Baldwin, playing off the rivalry between the Boston Red Sox and New York Yankees. In 2012, he started narrating the show Head Games on the Discovery Channel. In 2018, he co-wrote, directed and co-starred with his wife Emily Blunt in the supernatural horror film A Quiet Place.